This dual M.2 SATA enclosure with RAID makes it easy to add ultra-fast, portable external storage to your USB-C™ or USB-A enabled laptop, tablet, smartphone or desktop computer. Its multiple RAID modes provide increased capacity, improved performance, or data redundancy. Quickly access, transfer, and backup your files wherever you go. This dual-slot M.2 RAID enclosure enables you to easily access your data by creating a high-performance, ultra-portable storage solution using two M.2 (NGFF) SATA SSDs. It’s ideal for creative professionals, such as photographers and videographers, as well as professionals in corporate, educational and government sectors who need fast access to important data files, while out in the field or back at the office. The RAID enclosure enables you to leverage the speed of your M.2 (NGFF) SATA drives by taking advantage of USB 3.1 Gen 2, with data transfer rates of up to 10Gbps. It ensures easy access to your files for data migration and data backups so that you can safeguard important data at all times. With multiple RAID options, the M.2 RAID enclosure enables you to gain increased storage size, performance, or redundancy. You can enjoy the peace of mind of knowing your files are continually backed up, or take advantage of greater speed and capacity offered by a combined solution. The enclosure supports RAID 0, RAID 1, Spanning, and JBOD, enabling you to choose your preferred backup mode. It also supports SSD TRIM to prolong drive lifespan and performance. The dual M.2 SATA enclosure provides a highly portable storage solution. With its compact design, you can tuck it away inside your laptop bag or carrying case and take it anywhere - to the office, the lab, or for mobile use, so that you can access your data wherever you go. Engineered with a solid aluminum housing, the dual-slot M.2 SATA enclosure helps to safeguard your data wherever you go. 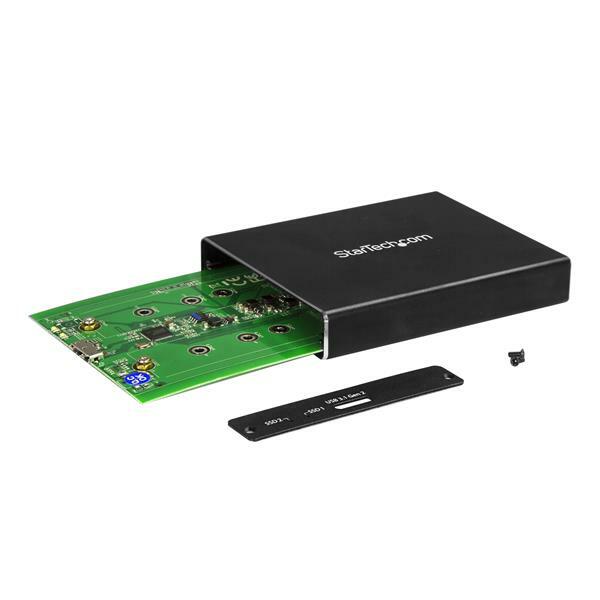 The M.2 SATA RAID enclosure is powered directly from the USB port on your device, so no external power is required. It comes with two USB cables (USB-C to Micro-B and USB-A to Micro-B) for flexible use with the latest laptops and tablets equipped with a USB-Type C™ port as well as legacy devices. The enclosure is OS independent, with no additional software or driver installation required, and is compatiIt’s also compatible with a Thunderbolt™ 3 USB-C port. 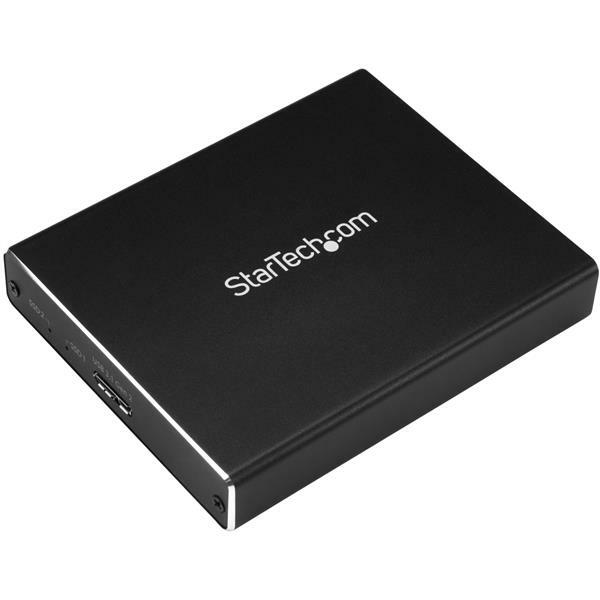 The SM22BU31C3R includes all required drive installation tools and hardware and is backed by a StarTech.com 2-year warranty and free lifetime technical support. What is USB 3.1 and how does it differ from USB 3.0? USB 3.1 is the most recent version of the USB (Universal Serial Bus) standard for connecting computers and electronic devices. It is capable of data transfer speeds up to 10Gbps, and while it can use the USB-C connector type, it can also use a variety of other connector types. To achieve USB 3.1 transfer speeds, your USB host connection, cables, and device must all support USB 3.1. USB 3.1 is also known as USB 3.1 Gen 2 (10Gbps). USB 3.0 is capable of data transfer speeds up to 5Gbps. USB 3.0 is also known as USB 3.1 Gen 1 (5Gbps). USB-B 3.1 cables are not compatible with USB-B 2.0 ports. Unless you use an adapter, USB-C ports or cables will not work with USB-A or USB-B ports or cables. Devices that require USB 3.1 transfer speeds of 10Gbps might not work with USB 3.0 or USB 2.0, or you might experience lower transfer speeds and impacted performance. Bus-powered USB devices that requires more power than what USB 2.0 can provide are not compatible with USB 2.0. For products related to this article, click here. 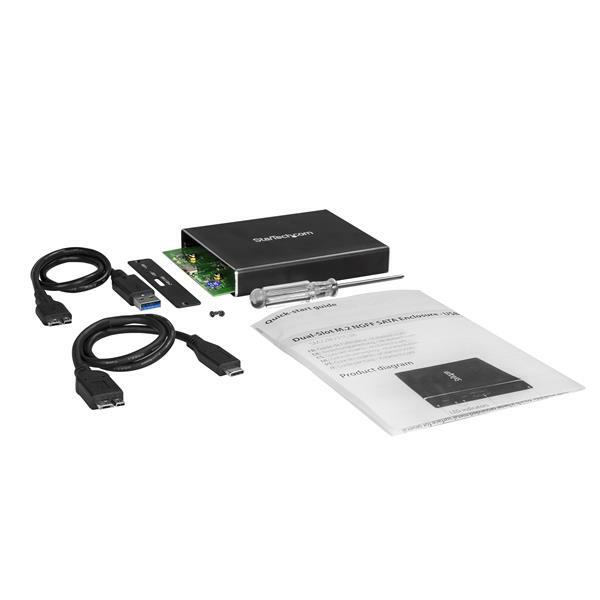 Which of my setup components need to support USB 3.1 in order for me to achieve USB 3.1 transfer speeds? Note: USB 3.1 is also known as USB 3.1 Gen 2 (10Gbps). Devices that support USB 3.1 should have the USB 3.1 symbol on them. If the USB 3.1 symbol does not appear on your USB source or device, refer to the information provided by the manufacturer to confirm whether the USB source or device support USB 3.1. Will the included USB cable perform at USB 3.1 Gen 2 speeds (10Gbps)? The included USB cable for this USB 3.1 Gen 2 device has been tested and verified to perform at USB 3.1 Gen 2 speeds of 10Gbps. How do I rebuild my RAID array? In order to rebuild a RAID array, you need to replace a physical drive with an identical drive on the same RAID controller. Although standard RAID levels are generally agreed upon throughout the industry, the implementation varies between manufacturers. RAID arrays are typically not accessible when they are moved to another controller, and data may be unrecoverable if the drives are out of order or have been formatted or accessed by another RAID controller. 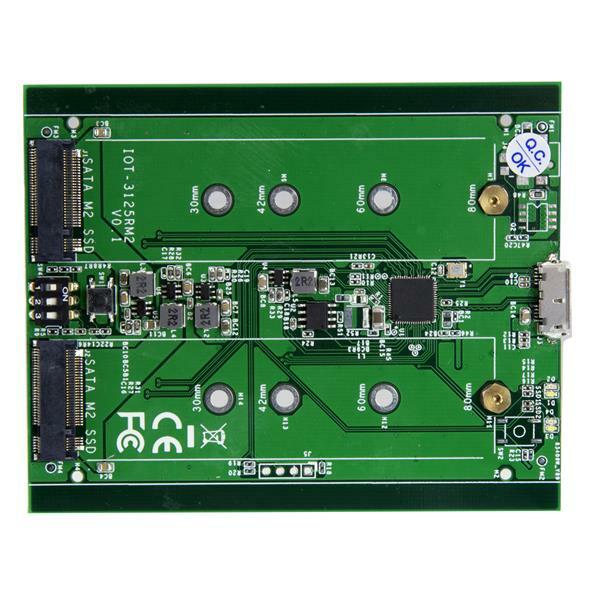 If a RAID controller has failed, you should get the exact same model of RAID controller. Note: If a drive or drives were damaged, it is possible that the RAID array may be permanently unrecoverable. RAID should not be considered a replacement for backing up your data. If critical data is going onto a RAID array, you should back up the data on another physical drive or logical set of drives. With the following RAID modes, recovery is possible using the same StarTech.com product. Refer to the following table for the appropriate method to use to recover your RAID array. RAID 1 Only one drive is needed for recovery. Determine which drive is operational by using the RAID management utility (if available) or test each drive individually on a different hard drive controller (for example, a hard drive docking station or SATA controller). Replace the failed drive with an identical hard drive. The array will rebuild and is accessible during the rebuilding process. RAID 3 Single drive failure will rebuild. Determine which drive is defective by using the RAID management utility (if available) or with diagnosis LEDs on the controller or enclosure. Replace with an identical hard drive. Note: Do not change the order of the drives. The array may be accessible during the rebuild, but you should let the controller rebuild without interruption so that performance is not compromised. RAID 5 Single drive failure will rebuild. RAID 10 Only one drive in a mirrored set can fail. 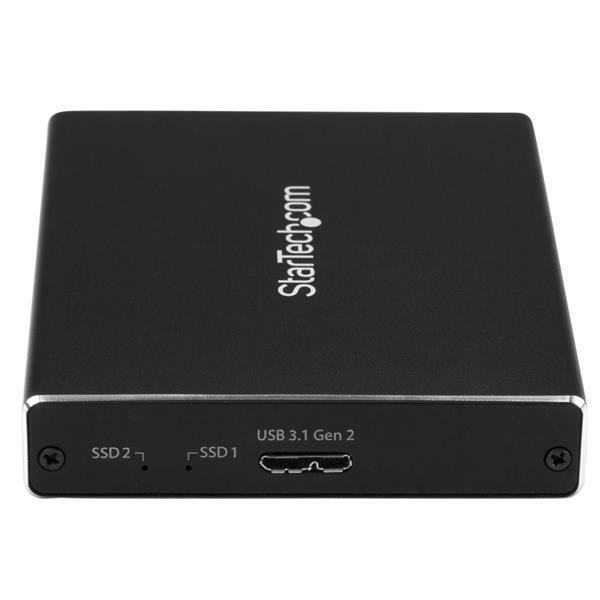 What do I do if I am not achieving USB 3.1 speeds with my USB 3.1 device? A USB host connection with multiple USB 3.1 ports might not be able to support 10Gbps on each port simultaneously. The type of port on a device does not determine whether the device is capable of USB 3.1 speeds. A USB-C port might not support USB 3.1 speeds, while USB-A and USB-B ports might support USB 3.1 speeds. Any other devices that you include in your setup, such as an older hard drive in a USB 3.1 enclosure, might create a point of congestion and slow down transfer speeds. To confirm the functionality of your USB host connection, its ports, and any other devices in your setup, refer to the information provided by the manufacturer. Using XPS 8930, 2xM.2 SSDs in RAID 0, got True 3.1 speeds write over 300MB/sec, read over 400MB/sec with large files. Excellent compact Enclosure! Powered by the USB 3.1 port even. (5 stars) What a speed demon! I tested this enclosure with two (2) 128GB m.2 sata drives configured with RAID 0 and it is quite fast! Comes with USB-A or USB-C cables and does not require an external power source. It has a solid aluminum enclosure so it survives the travels of a road warrior! This is now a part of my daily tool kit. I received this product in exchange for an unbiased review. This unit delivers as advertised. Speeds on both Raid 1 and JBOD were great. Just put the drives in, configure the dip switches and plug into your computer. I like the fact it comes with both USB A and USB C cables. It also comes with a small screwdriver so you have everything you need right out of the box. Great little unit for transferring data around or for backups. I received this product in exchange for an unbiased review. I am very happy with the performance. I set it up with a Raid 1 config for portable storage. The data transfer speeds were adequate. The aluminum case is sturdy and can handle being in the bottom of my laptop bag.